WALLACE: Now let’s bring in the king of conservative talk radio, Rush Limbaugh, live from his EIB studio in Florida. Rush, welcome back to Fox News Sunday. RUSH: Thank you, Chris. Great to be here with you. WALLACE: What do you think about this idea of students mobilizing across the country, a march on Washington, a march on communities, students trying to get politicians to act? RUSH: What I found interesting about the students — and, by the way, they are very articulate and you have to feel for them. I mean, this is… It’s wrecked their lives. They are a combination of scared and angry. But, Chris, I have to ask if anybody is really serious about solving this, ’cause none of this… And, by the way, I couldn’t care less about the gun angle of this. None of this is going to solve anything. WALLACE: — and we have now learned that just last month that someone close to Nikolas Cruz, the shooter, called the FBI tip line and, according to the FBI, said this… He talked about his gun ownership, desire to kill people, erratic behavior and disturbing social media posts as well as the potential of him conducting a school shooting. But that information was never forwarded to the Miami field office. How do you explain that? That’s what has to change and it’s going to take some really smart people to figure out how to do that without violating civil liberties and the Fourth Amendment and so forth. But it’s clear that the way we deal with this now… Chris, this is totally political. The students think they are taking politics out of this. The minute they bash the NRA, its politics, and the point for many is this is an event that advances a political agenda for the American left and the Democrat Party: Bash the NRA. RUSH: I said it Friday. WALLACE: I know you… I — Well, maybe he listened to you. 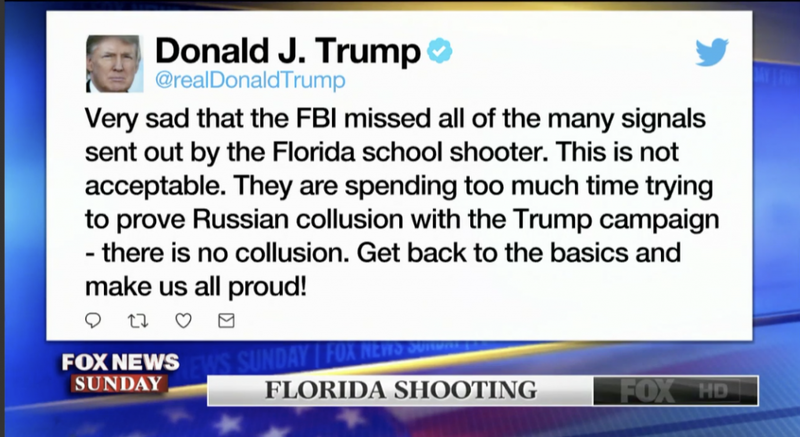 (chuckles) “Very sad that the FBI missed all of the many signals set out by the Florida school shooter. This is not acceptable. They are spending too much time trying to prove Russian collusion with the Trump campaign. There is no collusion. Get back to the basics and make us all proud!” Do you really see a connection between the FBI investigating the Russia investigation of potential Trump connection and the fact that they missed the signals here? RUSH: Once that happens, you can forget about a solution. We are never going to get one once politics enters the scene and corrupts it. WALLACE: Let me… At the risk of raising your ire and those of your millions of followers, let me ask you a question about guns. To buy a handgun, you have to be 21 years old and undergo a three-day waiting period. WALLACE: But to buy an AR-15, a semiautomatic rifle you can be 18 years old and the background check takes just minutes. Question: Is that sensible? WALLACE: So, what is the one single thing? You say identify them. I mean, look, there are a lot of disturbed people out — and the vast majority don’t do anything. Nikolas Cruz did do something and, yes, there were warning signs. WALLACE: But how do you identify them? RUSH: This guy was identified by everybody that knew him! The FBI knew who he was. The solution to me — I know this is going to cause all kinds of angst. The solution is we need concealed carry in the schools. If we are really serious about protecting the kids, we need a mechanism to be defensive when this kind of thing starts. If we are not going to take action to stop it, we’d better have mechanisms in these schools to stop it when it breaks out. If we don’t do that, than all the rest of this is nothing more than political posturing for the 2018 midterms and for the 2020 election. WALLACE: Rush, thank you. You’re coming back later in the program to discuss a number of other issues. Talk to you in minutes. WALLACE: This has been another one of those weeks in the Trump era with major developments in a number of areas, from an immigration deadlock in the Senate, to an explosive indictment in the Russia investigation. 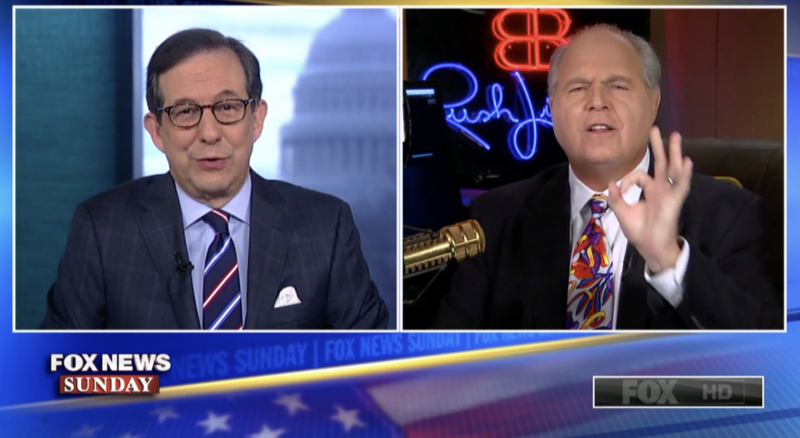 Rush Limbaugh is back with us again to discuss it all and, Rush, as I try to explain to your listeners, if I interrupt you it’s just to move you along so we can cover more territory. RUSH: I’ve given you the dispensation on that. They’re very much aware of this, that it might happen, and you’re cool. WALLACE: Okay, I’ve got papal dispensation. WALLACE: Let’s start with the Russia investigation and the announcement of an indictment alleging a sophisticated Russian scheme to try to interfere with the 2016 presidential election. Here’s what candidate Trump said about all of this during the campaign and what the deputy attorney general said on Friday. TRUMP: It could be Russia, but it could also be China. Could also be lots of other people. It could also be somebody sitting on their bed that that weighs 400 pounds, okay? ROSENSTEIN: The defendents allegedly conducted what they called information warfare against the United States with the stated goal of spreading distrust towards the candidates and the political system in general. WALLACE: Now, I want to emphasize that there is no evidence in that the deputy attorney general made it clear, no evidence of any collusion between the Trump campaign and the Russians, but doesn’t this indictment disprove what Mr. Trump has been saying all along, that any talk about the Russians is a hoax and that the special counsel investigation is a witch hunt? RUSH: I would be very careful if I were President Trump here. This is just one of many different areas the special counsel is investigating. And without getting into details of this, because I think this — everybody is trying to affect the outcome of elections, Chris. And everybody is poisoning the internet, everybody’s doing it, both parties, insane lunatic individuals. The Russians are pikers, actually, compared to Americans doing this. The problem is that it’s illegal for them to do it. The danger for the president is it would be very, I think, seductive for him to embrace this, totally embrace this, and say, “See, see, I’ve been vindicated!” The worst thing he could do in his world is to validate this whole investigation by claiming victory here, because what if down the road there is another indictment or series of indictments that do name Trump or do name the Russians and Trump campaign colluding, because that’s what this is about. This is about getting Trump, Chris. This whole thing is about setting Trump up for impeachment if the Democrats win in 2018. Donald Trump remains in the crosshairs. He is the target and there is no let up in that, no matter what this indictment does or doesn’t say. WALLACE: Let me pick up on that because you say that the real scandal here is the effort by the Clinton campaign and the Obama administration to try and sabotage candidate Trump and now President Trump. RUSH: Oh there’s no question about it. If you look at this indictment — I’ve had people say, “Does this mean that Hillary could be indicted or Fusion GPS?” No. Because this indictment doesn’t charge anybody with collusion. It says they’ve defrauded the United States with mail fraud and wire fraud. You can’t get the Fusion GPS or Steele people. The real collusion, and there’s no question about this, this is a paid political opposition document that was made to look like legitimate intelligence. It was perhaps used to defraud the FISA court. WALLACE: You’re talking about the Steele dossier here? RUSH: The Steele dossier and pretty much everything that they’ve used. Every story — I was on this program one year ago, one year ago and I told you that this whole thing, that Trump colluded with the Russians was bogus, that there was never going to be any evidence for it, it did not happen. Every news story about it since then has included that, just like this indictment right here. No allegation in the indictment that any American was a knowing participant, nor is there any allegation this scheme affected the outcome of the election. Bingo! There isn’t gonna be. WALLACE: But, Rush, let me ask you, the president’s top foreign policy advisor in the campaign in the first couple of weeks of his White House, General Michael Flynn, has pleaded guilty to lying to the FBI. So has another campaign advisor, George Papadopoulos. Aren’t you at least curious to find out what they have to say? WALLACE: Well, wait a minute. Why do you think he pleaded guilty? I mean, it wasn’t an indictment. He pleaded guilty. RUSH: Maybe he wasn’t told — well, because they had run him dry. His family was being destroyed. His financial net worth was destroyed. He was being broken. He had to stop the bleeding. The question is what was Flynn told by the FBI, by James Comey? Was Flynn told by the special counsel — by the way, the FBI does not believe he lied in their interview, in his interview with them. That seems to me to be crucial and the new judge in this case I think is going to take that up. I think this is all politics and, Chris, it hasn’t changed from the get-go. It is about protecting Hillary and Obama. Obama is the primary person being protected here because all of this spying and all of this collusion to destroy Trump happened with his knowledge and probably encouragement. And the reason Hillary isn’t charged is because that would mean Obama would have to be exposed as participating in the scheme too. WALLACE: Let’s move on to immigration. The Senate voted down four proposals this week, everything from the president’s basic plan to a bipartisan plan. On your radio show, you recently said that you would be willing to grant citizenship to all of the DREAMers in return for full funding for the border wall, and at a certain point after a lot of pressure, the Democrats seemed to agree to that and the president demanded more. So what’s going on here? RUSH: Well, this will actually take a lot to unpack. It’s a political issue that the Democrats do not want solved. All this is is an effort by the Democrat Party to provide for themselves a current underclass. They need a permanent underclass that is dependent on the government for their survival. That’s why they want illegal immigrants granted citizenship. They don’t want the issue solved. They don’t want any issue solved, legislatively or otherwise, before the 2018 elections. And I think Trump is partially exposing that with the various different proposals that he’s making. He’s giving them pretty much what they want and they are turning it down because they don’t want it solved. I will make you another deal right here. I would be willing right here to support an effort to grant permanent citizenship to whatever number of illegal immigrants there are in the country, tomorrow, if you will make as part of the deal they can’t vote for 15-25 years. And if they will agree to that then I will grant them amnesty. RUSH: Well you see how many takers you get. You will get zero takers on that on the Democratic side. WALLACE: You’re pretty powerful, but I’m not sure you can make that deal on behalf of Congress and the president. But it’s a pretty interesting offer. Let me turn to the president. You say in year one that Donald Trump has had one of the most productive years, not first years, any years, of any modern president. Explain. RUSH: It’s undeniable. You look at the economy just this first year and compare it to the eight years of Obama, even the last 12 years if you want to. We have not had this kind of economic revival in the economy. Wall Street has been going crazy for a long time, but in the economy, in the place where people work, the people who make the country work, their lives are changing dramatically, overwhelmingly, economically. Look at all the wage increases, the new jobs, the bonuses and the expansion of benefits. The president is delivering on many of the things that he committed to and promised. The Democrats demagogued and lied about this tax cut, telling everybody their taxes were going to go up. The Democrats now are beginning to regret — they can see the polling data, they can see that people are starting to really love this tax reform bill because they are finding out the Democrats lied to them about it, and there’s not one Democrat fingerprint on it. There’s not a single Democrat that can claim any credit for this massively booming United States economy. 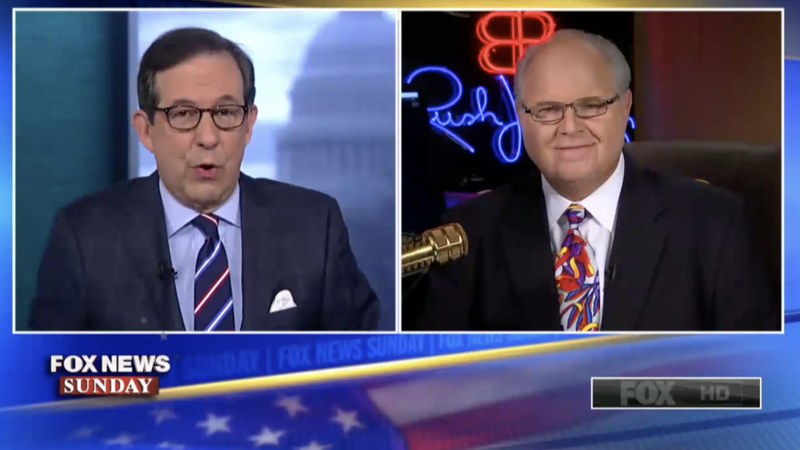 WALLACE: But Rush, let me just pick up on one last thing, because he certainly deserves credit for a lot of things, but he failed to repeal Obamacare, he and the Congress. He has approved this new spending plan, which is going to add half a trillion dollars to our national debt over the next two years. Does that disappoint you? Do you hear about it from any of your listeners? RUSH: You know, now that is a fascinating question. In terms of this budget busting spending, I haven’t had one caller complain about it. I’m sure I will now, but I haven’t had one. It’s been surprising to me that there hasn’t been a single complaint compared to the spending complaining back in 2010 when the Tea Party was founded. But I think the massive size of these deficits is not going to be as large as predicted because of the tax cut. There’s going to be revenue flowing into Washington they aren’t counting. It’s still gonna be deficit building, there is no question, but it’s not going to be nearly as bad as people think it is. What was the other thing you asked? WALLACE: You’ve got about 45 seconds, Obamacare. RUSH: Well, we got rid of the individual mandate, that’s been proposed, that’s the guts of it. Formal repeal and replace, yeah, that hasn’t happened. May be a mistake to do it first, not sure. But, hey, this is just the second year. There’s all kinds of time to come back and fix a bunch of things if you want. We’re just getting — They are just getting started. WALLACE: Rush, thank you. Thank you for joining us again today. Folks, again, when I interrupted, it was just to move along so you could hear Rush on more subjects. WALLACE: Rush, it’s always a pleasure to talk with you. Come back. RUSH: Any time you want me, I’m here.